Landsec’s Piccadilly Lights is one of the UK’s most instantly recognisable landmarks, immortalised in numerous song lyrics and on film. But it’s also more. From its first campaign back in 1908 to the 2017 unveiling of its latest makeover, the site has stood testament to the enduring power of the poster and now the creative potential of digital outdoor. The foundations of the Piccadilly Lights were laid back in 1819 with the building of Piccadilly Circus to connect Regent Street with Piccadilly. Piccadilly Circus tube station did not open until 1906, however, and two years later the first illuminated advertising hoardings appeared, along with the first advertiser – Perrier. Over the following years – and the past 50 years especially – the site became closely associated with the latest technological advances as it evolved and expanded through a number of iterations. In 1923, for example, electric billboards were set up on the façade of London Pavilion – the site of a music hall built in 1859 then reconstructed when Shaftsbury Avenue was built in 1885. The first ad to use this then new technology was Bovril. Eventually, the original light bulbs were replaced by neon signs and then, in 1998, by digital projectors. In the 2000s there was a gradual move to LED displays, which by 2011 had completely replaced the neon lamps. But the biggest transformation of all came three years later. "The most significant thing that has happened to Piccadilly Lights – not just in the past 50 years, but in its entire history – has to be Landsec’s investment and relaunch as one single screen in October 2017," says Richard Malton, chief marketing officer at Ocean, which has managed the Piccadilly Lights site since 2016. 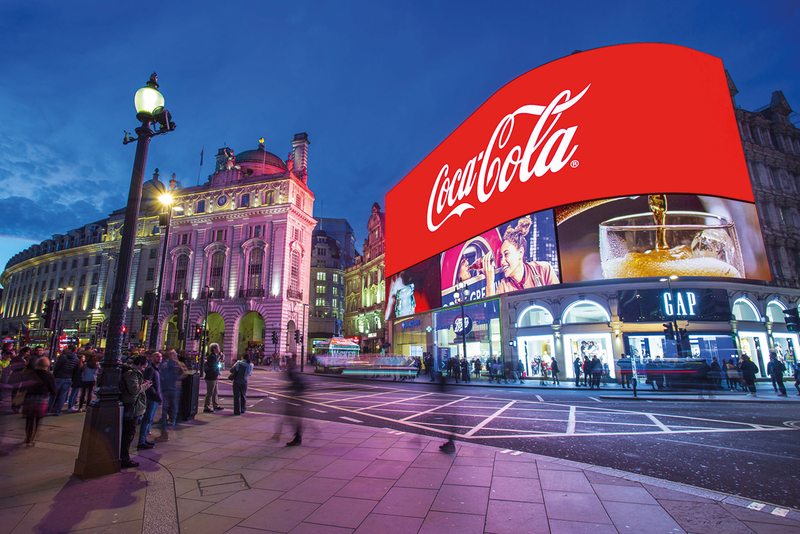 "Not only was it significant for Piccadilly, it was a reboot that turned one of London’s most famous landmarks and tourist attractions into an enabler for global brands to communicate with a global audience – a stage unprecedented and unrivalled." The new Piccadilly Lights replaced the previous patchwork of screens with a single 783.5m2 LED digital screen – the largest of its kind in Europe. With each pixel 8mm from its nearest neighbour, the new display boasts a resolution 1.4x greater than 4K LED – equivalent to a 1,000-inch-wide TV screen – and is capable of producing more than 281 trillion colours. 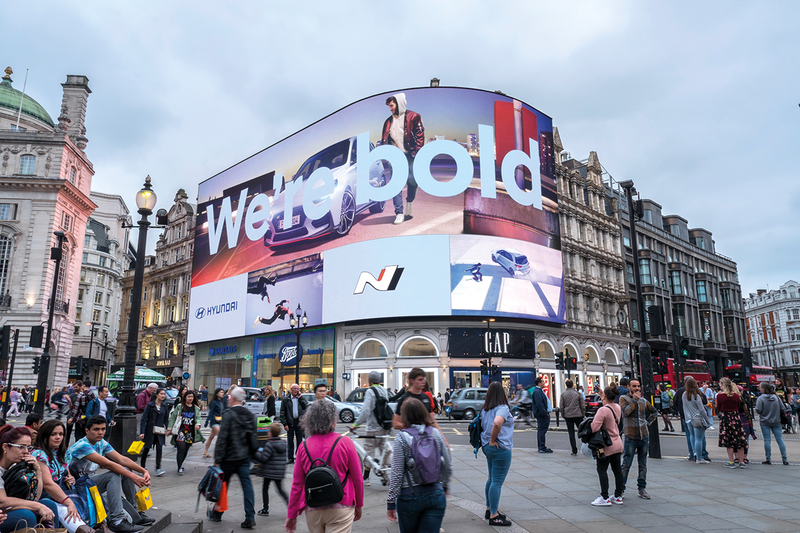 And the new advertising proposition – the launch of which attracted an audience of more than 12 million when it was live streamed on YouTube and Facebook – is a lasting legacy for this historical central London location. 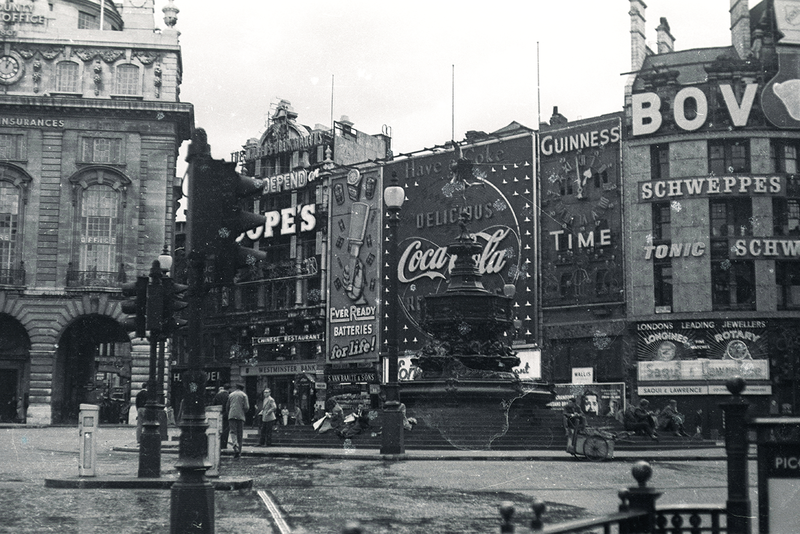 The Piccadilly Lights has long been known and loved for its distinctive patchwork display of advertisers. One of the most familiar brands using the site to advertise is Coca-Cola, which took its first sign at Piccadilly Circus in 1955. More recently, the drinks giant has used the remade site to tune into the zeitgeist and respond to topical events. Sanyo is another name closely associated with the Piccadilly Lights site. After taking on its first sign in 1978, the Japanese electronics giant took one of the then five permanent spots (each known as a ‘light’) until 2011 when it was replaced by Hyundai – the first new company to acquire ‘a light’ in 17 years. Also playing a role in the evolution of Piccadilly Lights were brands such as Guinness; TDK, which in 1990 took over space previously used by Kodak; McDonald’s and Nescafé. Then in 2017 Coca-Cola, eBay, Hunter, Hyundai, L’Oréal Paris and Stella McCartney were the six brands that relaunched the site with a dynamic rotation of full-motion digital ads that recreated the familiar brand patchwork through state-of-the-art technology. "Stella McCartney, a brand that hadn’t advertised in mainstream media before, was seriously impressive. Appearing on Piccadilly Lights not only set the bar for luxury and fashion brands – it was a huge coup," Malton adds. Over the months that followed, 20th Century Fox created a trailer for the launch of Deadpool 2 specifically for the location and directly targeted at London. 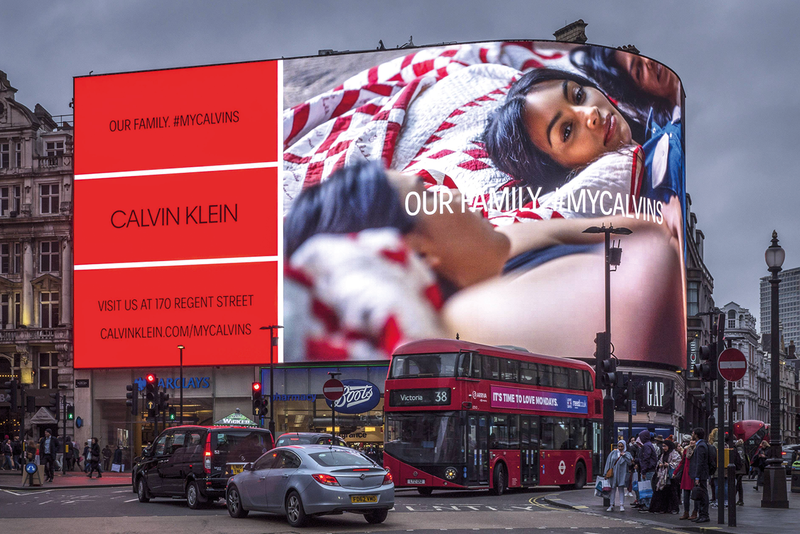 Calvin Klein, meanwhile, used it for its #MyCalvins campaign in which the Kardashian family became the only people to appear on the site twice within a single year. 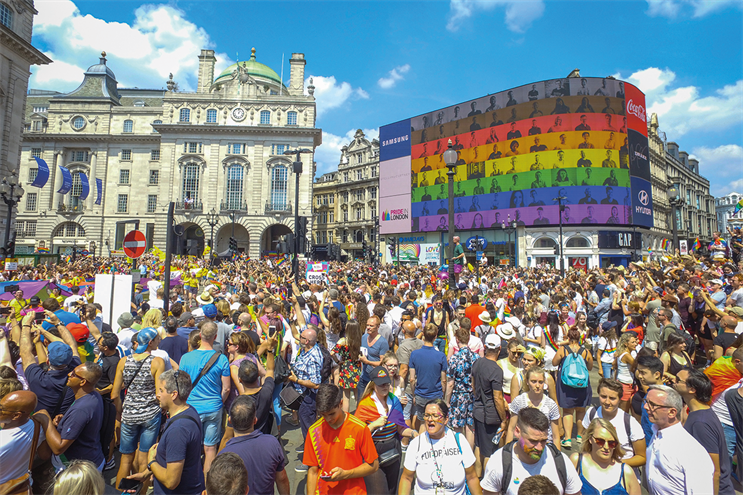 Then it hosted the first audio-synched campaign of the #PrideMatters anthem for the Pride in London Parade 2018. And the excitement it sparks among brand owners themselves was demonstrated when eBay flew board members from the US to the UK to see their ad in situ, and creative directors from Stella McCartney found inspiration by visiting the site to design from it. The Piccadilly Lights has also been deployed for a number of other causes – raising awareness of the campaign to save our oceans from plastics, for example. "Without doubt, the relevance and unique nature of the location plays an unmistakable part in shaping and reflecting the country’s psyche," Malton notes. During the few times in its history that the Piccadilly Lights has gone dark – the funerals of Winston Churchill and Diana, Princess of Wales, for example, or the Lights Out London campaign in 2007 (not forgetting the blackout during WW2 and occasional power cut) – the dulling of it has had significance, he believes. "Why? Because it’s the centre of town, it has its own living area and space," he says. "But above all, for many people it is the beating heart of London."